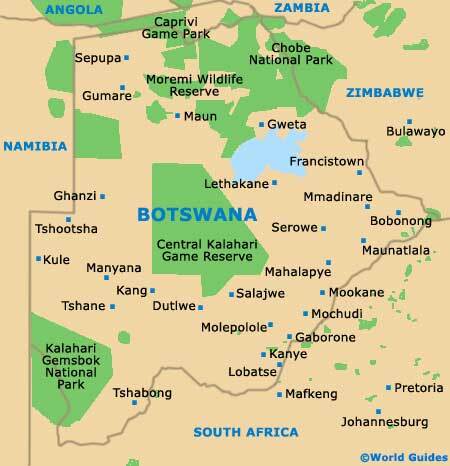 The story of the Republic of Botswana over the past 50 years is certainly one of success and relative prosperity. Home to no less than three of the most world's important diamond and mineral mines, Botswana is a vast country and appeals to the more intrepid of traveller, with plenty of time to make the most of their Southern Africa tourism experience. Much of Botswana is a true wilderness, with expansive savannahs covered in scrubland, and spreading semi-arid areas, such as the valleys of the Kalahari. 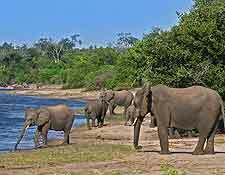 For many tourists, it is the rich African wildlife that is the reason to visit, with stable water supplies within both the Chobe National Park and the Okavango Delta meaning that safaris here are in demand. 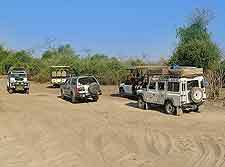 In other parts of Botswana, such as both the national parks of the Makgadikgadi and the Nxai Pan, if you time your visit right, you will likely encounter large groups of elephants and giraffes, and epic herds of migrating wildebeest and zebras. 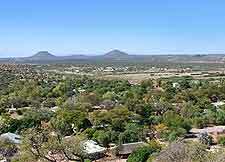 Gaborone is the capital city of Botswana and is conveniently close to a number of popular nature reserves. Tourist information in Gaborone comes in the form of the Department of Tourism office at The Mall (Standard Chartered Bank Building) and also the Department of Wildlife and National Parks (DWNP) in the Government Enclave on Khama Crescent. Being one of the most visited regions of Southern Africa, there is certainly no shortage of tourist attractions in Botswana. Although the safaris and national parks really do stand out, many further places of interest definitely deserve mentioning, such as the Orapa House in Gaborone, which has long been a major player in the global diamond industry. Also residing in Gaborone is the historic and recently regenerated Main Mall shopping plaza, the St. Claire Lion Park and also some rather tranquil botanical gardens. In the town of Serowe, the Khama Rhino Sanctuary is one Botswana game reserve with a difference, gaining a charitable status and working hard to conserve both black and white rhinos. For some serious bird watching, the Nata Bird Sanctuary see crowds of visitors 'flock' here each year, along with the seasonal migrants of a winged nature. 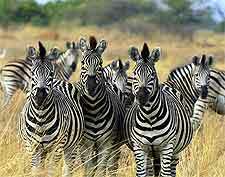 More information about Botswana Tourist Attractions. When it comes to landmarks in Botswana, there are plenty to choose from, although it is fair to say that most have been created by the hand of nature. The most impressive include the four Tsodilo Hills and their extraordinary assortment of ancient rock paintings, which number approximately 4,500 in total. 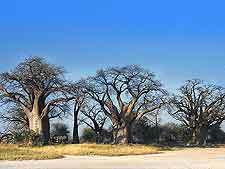 Next to Gaborone and boasting some wonderful cityscape vistas from the top, the Kgale Hill is worth the climb, while in the Nxai Pan National Park, a group of seven epic baobab trees named the 'Baines Baobabs' have become incredibly famous, since this species more commonly grows as solitary individual specimens. In Makgadikgadi, Kubu Island rises out of the spreading salt flats and makes quite a dramatic statement. Head to Gabane and you will find that the spirit of famed explorer David Livingstone lives on in his namesake cavern, the Livingstone Cave (Kobokwe Cave). More information about Botswana Landmarks and Monuments. There may not be a glut of museums in Botswana, but those that do exist are generally something special. The National Museum and Art Gallery is particularly notable and stands within Gaborone, where it is home to many wonderful original paintings and local information. Other reliable choices for culture vultures in this region of Southern Africa include the Khama III Memorial Museum at Serowe, the Phuthadikobo Museum at Mochudi, and also the Kuru Museum and Cultural Centre in Maun. These attractions are certainly gaining popularity, although remain a little in the shadows at present. More information about Botswana Museums. Visitors often come to Africa with a view to travel and see the best that the country has to offer. All around the border of Botswana are some astonishing sights that beckon even the laziest holidaymaker. Directly south of Botswana is South Africa, where some truly famous cities await tourists, such as the metropolis of Cape Town and its hard-to-miss Table Mountain, the spectacularly wealthy city of Johannesburg and its rich gold -mining heritage, and the administrative capital of Pretoria, where the National Zoological Gardens of South Africa are based. You may also like to consider an excursion to the northerly border between Zambia and Zimbabwe, where the awe-inspiring Victoria Falls cascade in all their glory, or to the east, where the Skeleton Coast of Namibia is known for its many decaying shipwrecks, which number more than 1,000 and are the result of heavy fog and rocky outcrops. 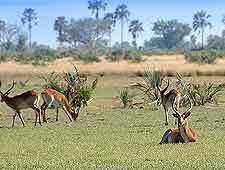 More information about Botswana Attractions Nearby.